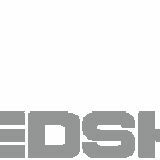 DEVELOPED BY MEDSHAPE, INC. IN CONJUNCTION WITH PATRICK ST. PIERRE, M.D. Tenodesis of the long head of the biceps is indicated for patients experiencing significant pain associated with biceps tendonitis or tenosynovitis, instability characterized by subluxation of the biceps tendon out of the bicipital groove, and traumatic or degenerative tearing or rupture of the long head of the biceps tendon. Often these pathologies are secondary to SLAP lesions, subacromial impingement, or rotator cuff tears. Benefits of surgical intervention with biceps tenodesis include reestablishment of the length-tension relationship of the biceps tendon, preservation of elbow flexion and supination strength, and superior cosmetic outcomes, in particular, avoiding Popeye deformity. 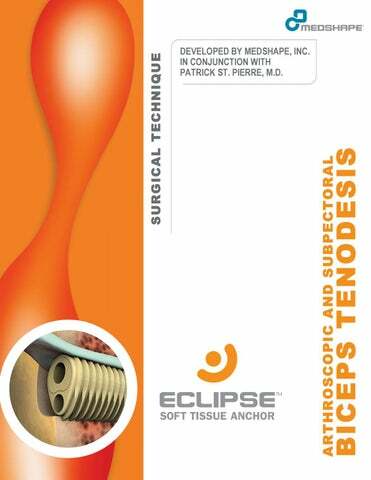 The Eclipse Soft Tissue Anchor is compatible with arthroscopic suprapectoral, mini-open suprapectoral, and subpectoral biceps tenodesis procedures. Diagnostic Arthroscopy A diagnostic shoulder arthroscopy is performed in either the beach chair or lateral decubitus position as per surgeon preference. Standard posterolateral and anterior superior portals are established.! The long head of the biceps tendon is assessed along its intra-articular portion to confirm diagnosis of partial tearing or SLAP tear at its insertion on the labrum. Using a probe, pull the extra-articular biceps tendon into the joint to assess a portion of the long head of the biceps tendon within the bicipital groove. Assess stability of the tendon by checking the integrity of the superior border of the subscapularis tendon. Using an arthroscopic suture passer, place several passes of a #2 suture at the proximal aspect of the biceps tendon to aid in tendon handling. Bring the sutures out of the anterior superior portal. Release the biceps tendon from its insertion at the superior labrum. Debride any remaining tendon stump on the labrum and any synovitis within the joint. Standard bursal resection and acromioplasty are performed as indicated. Option 1: Pull on the traction sutures to remove the biceps tendon through the anterior superior portal. Using the Soft Tissue Sizer, measure the diameter of the tendon. A formal whipstitch can be prepared on the free tendon end using the QuikWhipTM #2 Surgical Suture. Option 2: Alternatively, for an all-arthroscopic technique, place a whipstitch in the proximal end of the tendon with an arthroscopic suture passer. Introduce the Tendon Fork into the joint and use the lasermarks to approximate tendon size. Pearl #1. Whipstitch the tendon to a length matching desired tunnel depth to provide a visual marker that the tendon is fully seated in the tunnel. Create an anterolateral portal that aligns directly with the desired bone tunnel location. Typical fixation sites for an arthroscopic approach range from within the bicipital groove to just distal of the groove and is left to surgeon discretion. Use the 2.4 mm Drill Tipped Passing Pin to drill to the desired depth, measured directly from the lasermarks on the Passing Pin. Then, drill over the Passing Pin with a Cannulated Reamer 1 mm larger than the diameter of the tendon. Refer to Appendix A for complete tendon, bone tunnel, and Implant sizing information. Pearl #2. Debride any soft tissue or debris around or within the drill tunnel. Improved visualization of the bone tunnel is critical in determining if the sheath has been inserted to the desired position. Pull the prepared biceps tendon back into the subacromial space. Use the Tendon Fork to push the suture-tendon complex into the bone tunnel. Verify the length of tendon in the socket by reading the lasermarks on the Tendon Fork. Select the Implant with a diameter that matches the diameter of the bone tunnel. See Appendix A for detailed tendon, bone tunnel, and Implant sizing information. Introduce the Implant Sheath and Bullet through the cannula. Position the Implant Sheath in the tunnel so that the compressed profile is adjacent to the tendon. Remove the Tendon Fork. Advance the Sheath into the tunnel. If necessary, mallet the metal Strike Plate on the Gun Knob to assist in advancing the Sheath into the bone tunnel. Do not twist or rotate the Deployment Gun while advancing the Implant into the bone tunnel. Pearl #3. Ensure the Sheath is 1-2 mm sub-flush in the bone tunnel, thereby maximizing Implant engagement with the cortex during fixation. Pearl #4. A 4 or 5 mm Implant can be inserted through a standard 8.25 mm cannula. A 6 mm Implant or larger will require a standard 10 mm cannula. If desired, push forward on the blue Knob Lock to allow free rotation of the Gun Body. The Gun Body can now rotate to the desired deployment position for surgeon comfort without disturbing Implant alignment in the tunnel. Push back on the Knob Lock to re-engage with the Gun Knob, preventing further rotation of the Gun Body. Squeeze the Deployment Trigger while pulling down on the blue Trigger Lock to release the Deployment Trigger. While maintaining slight forward pressure on the Gun, squeeze the Trigger to advance the Bullet into the Sheath. When the Trigger no longer exhibits resistance, the Implant is fully deployed (approximately two pulls of the Trigger). Pearl #5. Be sure to apply slight forward pressure while pulling the Trigger to ensure that the Implant remains seated in the tunnel. Push forward on the Knob Lock. Turn the Knob counterclockwise until the Gun releases from the Implant (approximately 10 turns). Make an incision on the medial aspect of the arm 1 cm below the pectoralis major tendon. Dissect and retract the underlying tissue, exposing the bone inferior to the pectoralis. Isolate and retrieve the biceps tendon out of the incision. With the elbow in full extension, apply appropriate tension to the biceps and mark where the tendon is level with the desired insertion site. Whipstitch proximal to this marking using QuikWhipâ&#x201E;˘ #2 Surgical Suture and trim off excess tendon. Using the Soft Tissue Sizer, measure the diameter of the graft. Select the Implant with a diameter that matches the diameter of the tendon. See Appendix A for detailed tendon, bone tunnel, and Implant sizing information. Pearl #1. Whipstitch the tendon to a length matching desired tunnel depth to provide a visual marker that the tendon is fully seated in the tunnel. Just inferior to the pectoralis major tendon, drill the 2.4 mm Drill Tipped Passing Pin to the desired socket depth, measured directly from the lasermarks on the Passing Pin. Drill over the Passing Pin with a Cannulated Reamer 1 mm larger than the diameter of the tendon. Refer to Appendix A for complete tendon, bone tunnel, and Implant sizing information. Option 1: Using the Tendon Fork, push the suture-tendon complex into the bone tunnel. Verify the length of tendon in the socket by reading the lasermarks on the Tendon Fork. Option 2: Alternatively, the Suture Lasso may be used to aid in tendon insertion. Use the Suture Lasso to pull one suture thread through the Sheath. The second suture thread should run along the outside of the Implant Sheath. Adjust the tendon so that it rests in the compressed profile of the Sheath. Cleat the threads on the Suture Cleat on the back of the Gun and insert the Implant and tendon into the bone tunnel. Remember to uncleat the sutures before releasing the Gun from the Implant. Note: While the Suture Lasso is a viable option, MedShape recommends using the Tendon Fork for easier tendon management. Position the Implant Sheath in the tunnel so that the compressed profile is adjacent to the tendon. Advance the Sheath into the tunnel. If necessary, mallet the metal Strike Plate on the Gun Knob to assist in advancing the Sheath into the bone tunnel. Do not twist or rotate the Deployment Gun while advancing the Implant into the bone tunnel. Pearl #2. Ensure the Sheath is inserted until it is flush with the cortex of the bone. If desired, push forward on the blue Knob Lock to allow free rotation of the Gun Body. The Gun Body can now rotate to the desired deployment position for surgeon comfort without disturbing Implant alignment in the tunnel. Push back on the Knob Lock to re-engage with the Gun Knob, preventing further rotation of the Gun Body.! Squeeze the Deployment Trigger while pulling down on the blue Trigger Lock to release the Deployment Trigger.! While maintaining slight forward pressure on the Gun, squeeze the Trigger to advance the Bullet into the Sheath. When the Trigger no longer exhibits resistance, the Implant is fully deployed (approximately 2 Trigger pulls). ! Pearl #3. Be sure to apply slight forward pressure while pulling the Trigger to ensure that the Implant remains seated in the tunnel. Push forward on the Knob Lock. Turn the Knob counterclockwise until the Gun releases from the Implant (approximately 10 turns). ! Measure the diameter of the graft using the MedShape Soft Tissue Sizer. For arthroscopic or suprapectoral biceps tenodesis, MedShape recommends selecting the Implant size 1 mm larger than the diameter of the graft and drilling the bone tunnel to match the diameter of the Implant. If the graft measures a half size, select the Implant size 1.5 mm over the size of the graft (e.g., for a 5.5 mm graft, select a 7 mm Implant). Because of the harder, more dense bone found in a subpectoral approach, MedShape recommends selecting the Implant size that matches the diameter of the graft and drilling the bone tunnel 1 mm larger in diameter than the diameter of the Implant. If the graft measures a half size, select the Implant size 0.5 mm over the size of the graft (e.g., for a 5.5 mm graft, select a 6 mm Implant). Note: When anatomy permits, always select the Implant size with the greatest length. If the bone is too narrow to accommodate the longer Implant, the shorter Implant may be selected for use. To determine the appropriate bone tunnel depth, round the length of the Implant to the next higher increment of 5 mm (e.g., for a 6 x 12 mm Implant, drill the bone tunnel to a depth of 15 mm). Eclipse Universal Tenodesis Procedure Pack includes a Soft Â® Tissue Sizer, Lasermarked 2.4 mm SurgiBit Stainless Steel Drill Tipped Passing Pin, Lasermarked Stainless Steel Tendon Fork, and 0.7 mm Suture Lasso. This brochure is presented to demonstrate the surgical techniques utilized by Patrick St. Pierre, M.D. MedShape, as the manufacturer of this device, does not practice medicine and does not recommend this or any other surgical technique for use on a specific patient. The surgeon who performs any procedure is responsible for determining and utilizing the appropriate techniques for such procedure for each individual patient. MedShape is not responsible for selection of the appropriate surgical technique to be utilized for an individual patient. Always refer to the package insert, product label, and/or product instructions prior to using any MedShape product. For further product information or to arrange a product demonstration, please contact your local MedShape representative or call Customer Service at 877-343-7016. You can also visit www.medshape.com. CAUTION: Federal (USA) law restricts this device to sale by or on the order of a physician. ÂŠMedShape, Inc., 2014. All rights reserved. Printed in the USA. Protected by Patent No. : US 8,069,858. Other U.S. and International Patents Pending. MK-10111 Rev 00. Issued 06/2014. QuikWhip is a trademark of MedShape, Inc. SurgiBitÂŽ Technology is protected by US Patent No. : D523313, D523398, & US 7,892,2235 B2. Foreign patents and design application pending and granted. All other trademarks are trademarks of their respective owners or holders.